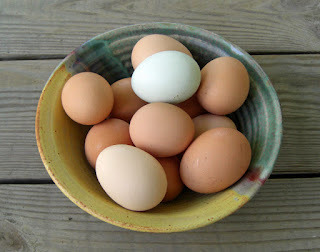 We often buy eggs at the local farmers market. This week, I opened the carton to discover that the eggs nestled inside varied from peachy-beige to tan to the color of a latte---with one pale blue egg for an extra surprise. This subtle rainbow looked like wall color suggestions for a very tasteful home renovation. Although consumers no longer insist on white eggs (except at Easter) we have a long way to go in order to break out of our near-monoculture of certain foods, such as bananas and avocados. At the farmers market we can see and try purple tomatoes or white eggplants. I hope everyone has the opportunity to experience the delight of a striped tomato or a rainbow's worth of eggs.